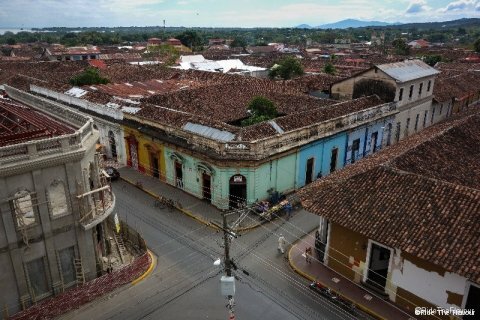 In Nicaragua... days are still beautiful ! 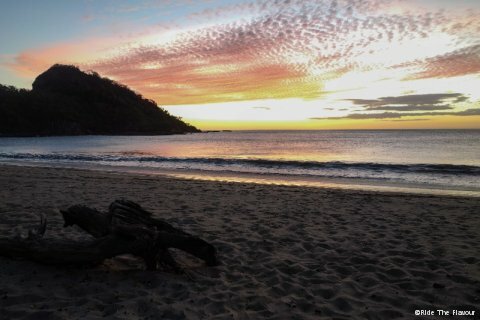 In Nicaragua… days are still beautiful ! Saturday, January 18. We entered Nicaragua with Ulf, a German cycling tourist who we had met about 20 km before the border. Our passport gets stamped, we withdraw a few Colones (the local currency) and grab a map of the country in a car rental agency… (clever!) We do not need anything more; we are ready to hit the roads of Nicaragua! 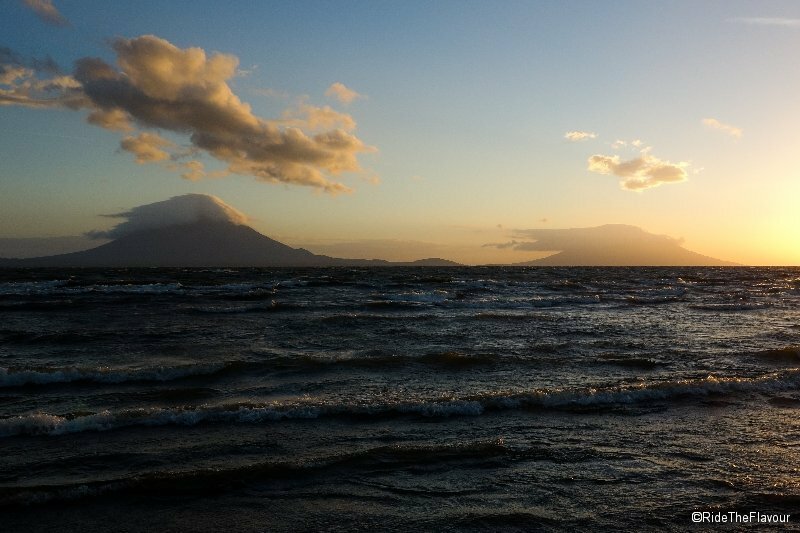 As we catch sight of the Lake Nicaragua (3rd largest lake in the world! 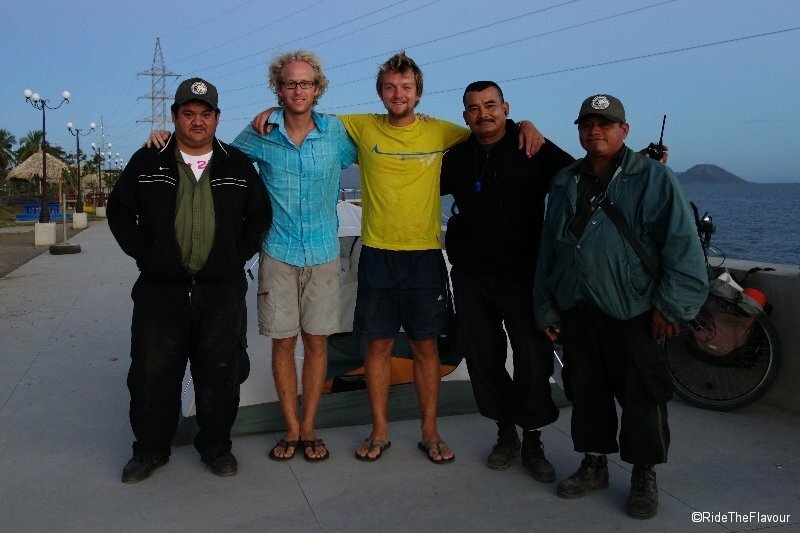 ), Ulf tells us about the Omotepe island and its two volcanoes, Concepción and Maderas. As usual, we have entered the country without any preconceived plan. Saying that we had a vague idea of the shape of the country would have been already a little pretentious 🙂 Then why not starting by a hike ? We had our plan! “You know, your volcano drew our attention. If you want, we could climb it tomorrow? Ulf even has a guide… Some are really more far-sighted than others! So once arrived in Rivas, we leave the panamericana and head towards San Jorge and its beach. At the end of the beach, a few people are talking on their terrace under a pale light bulb. A few meters before the house, a patch of grass. The ideal spot to pitch the tent. “Good evening, can we camp here? We do not want to bother you. This is how we meet Walter and his family, the kindness and generosity embodied. They bring us coffee and bread, even before we introduce ourselves! The next day, we wake up 5:30 am. A 7 am, the first ferry of the day leave the wharf of San Jorge and at 9 am, we disembark in Moyogalpa on Ometepe island. As we start climing the sun is already burning, but fortunately we walk under the cover of a dense vegetation. We are half way to the top when green becomes black and blue becomes gray. The plants become stones and the sky becomes cloud. 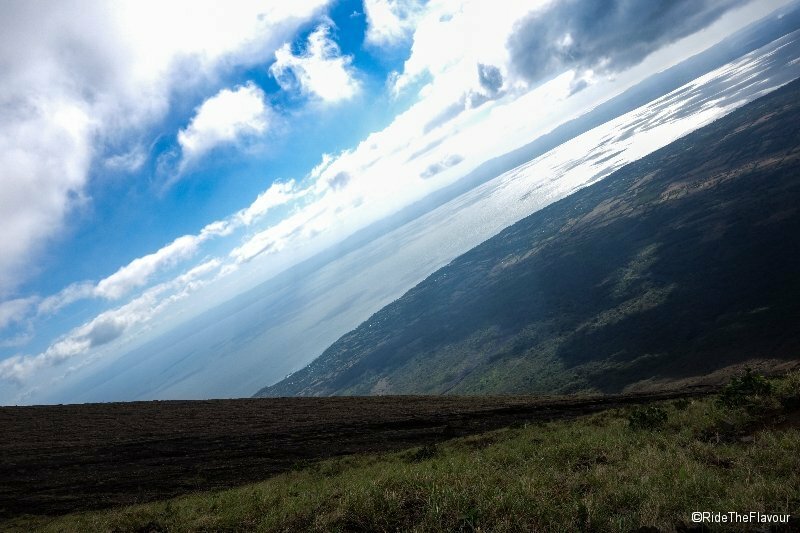 The slope suddenly increases up to 30-35 °, we are back to prehistoric ages when men were still crawling… Within an hour, however, the last 800 vertical meters are behind us and we reach the crater. We do not even see 5m away from where we stand but we stand indeed at an altitude of 1600 m! The next day, after a last coffee/bread, we say goodbye to Walter and his family. Muchos gracias amigos! 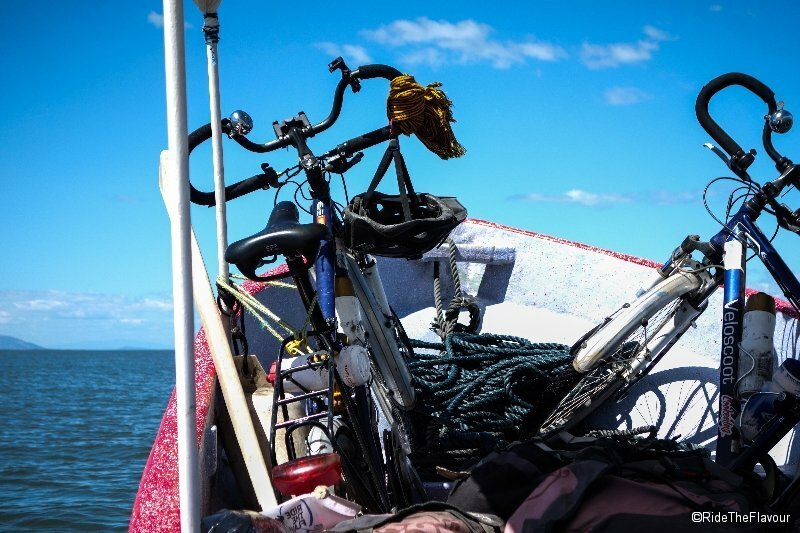 We get on our bikes (that we had left at Walter) and ride towards the Pacific coast and Playa Gigante. 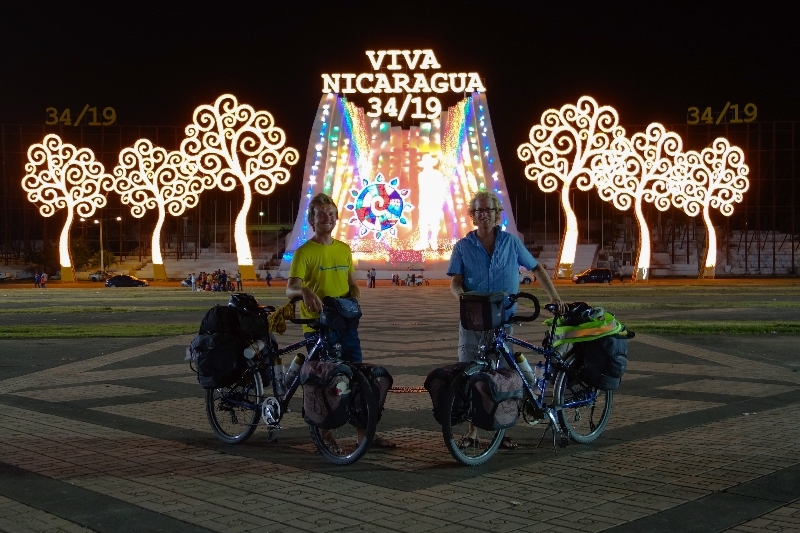 The last 15km are nothing but dust and stones… Costa Rica and Nicaragua, same difference: tar never reaches the beaches! But once arrived, through Warmshowers network (thanks John! ), we are hosted for free in the dormitories of the hotel Camino del Gigante. And that’s a good thing because we have two reasons to stay: Leo have to treat a nasty infection… and of course it would be a shame not to enjoy this small corner of paradise! Every morning, an itinerant fruteria brings us our daily ration of fruits. Bananas and pineapples become our traditional breakfast. At this time of the day, the beach and the Pacific are impassive. 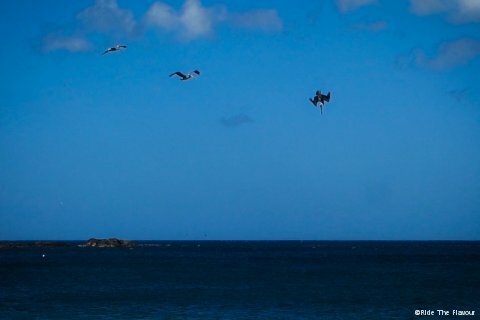 The picture only lives by the waves and the birds. 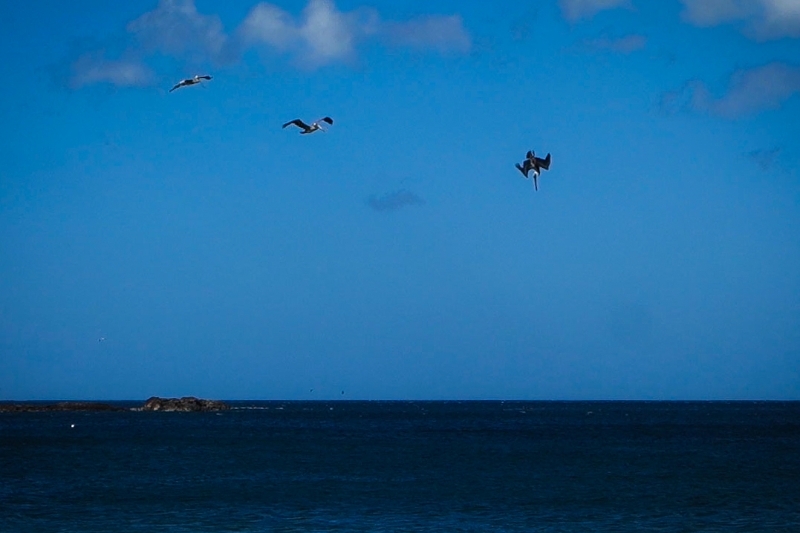 Pelicans and terns lead the show from sunrise to the sunset. Loons follow one another, the competition does not suffer from any interruption! And all styles are allowed… Our favorite? Without any hesitation, the pelican! After a week in this idyllic atmosphere, Leo was healed and we had enough of the tranquility of paradise. It was time to get back on the roads of adventure! We quickly realize that despite their geographic proximity Nicaragua and Costa Rica differ in many ways: here fruits are way less tasty (pineapples are white and much less sweet, avocado have neither flavor nor texture…), landscapes are less lush, fauna is less diverse, etc. But even if riding through Nicaragua was not that entertaining, there were a few good surprises along the road! We spent half a day walking in Granada. 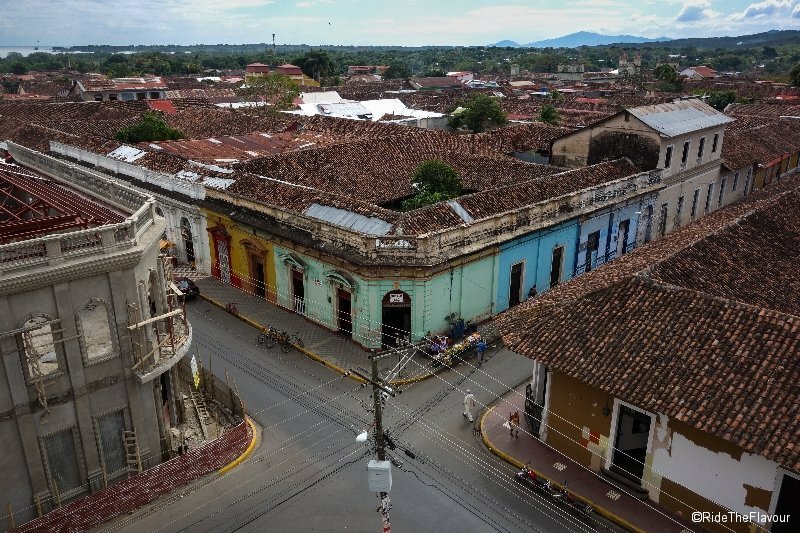 Far from being an architectural beauty, this colonial city is yet the most pleasant city that we have seen been since the beginning our our ride in Central America. The main square is very nice, houses are colorful, almost all built around a courtyard… And its market (South of the main square) conceals many a treasure! The idea was to taste every food that we did not know, and we ended up having our whole breakfast (and even the beginning of our lunch) within the market! A small anecdote in Managua, the capital of the Nicaragua: we slept in a park under construction on the banks of the lake, protected by a private security company… After having sent us to the tourist police (“it is prohibited to camp here”), they might not have been very happy to see us coming back, this time with the benevolence of this very same police! We had asked only for a place safe enough to sleep for one night, and we ended up camping under the protection of an armed patrol! 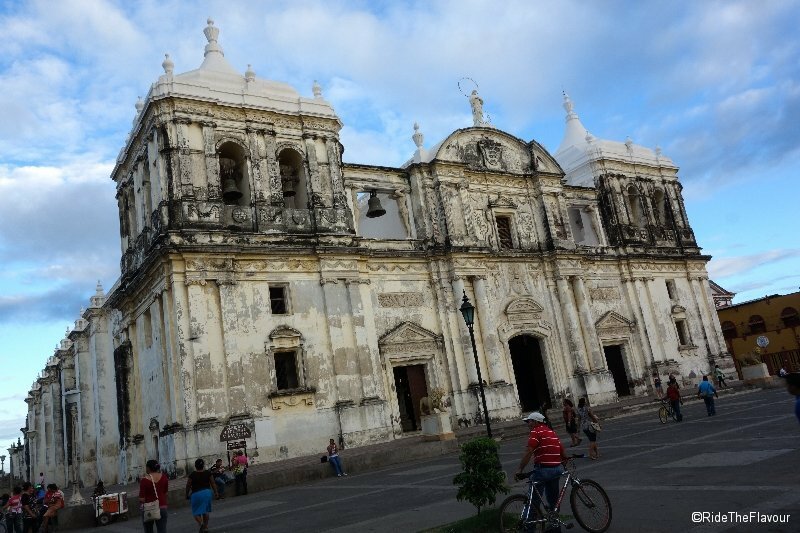 After Managua, we stop by León to admire its cathedral (one of the few UNESCO World Heritage monuments in Nicaragua) and then continue on our route toward Potosi, where we will take a boat to La Union, in El Salvador. The last amazement of our ride through Nicaragua took place on Jiquilillo beach. Some 40 km far from Potosi, we left the paved road to reach the coast, not far from Padre Ramos national reserve. We wanted to take a last deep breathe of nature, walk through the mangroves and perhaps be lucky enough to see birds and crocodiles. But we did not see anything close since we could not approach the mangrove. 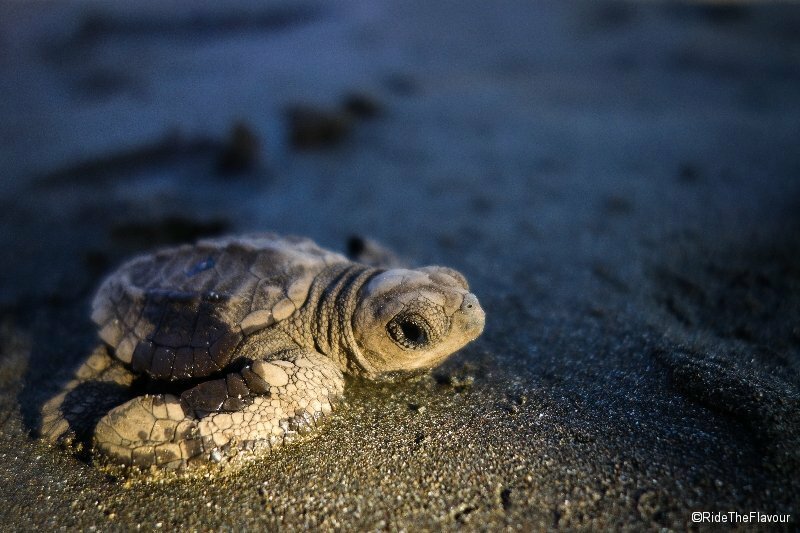 Renting kayaks was too expensive and no one was available to take us around the reserve… Which turned to be a minor disappointment beacause we were instead able to attend a wonderful spectacle: the release of a hundred baby turtles by a protective association! After a short walk on the beach toward the sea, we put them back on a bowl and took them behind the waves. They were then released for good, and for a few moments, before they escape in the wide ocean, we could swim surrounded by a hundred of these baby turtles! 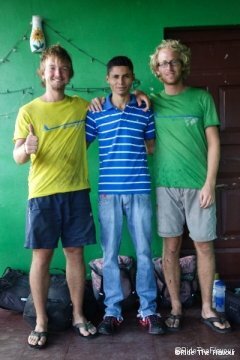 The next day, after 13 days in Nicaragua, we were in a boat rushing toward El Salvador!